Dr. John Brooks Slaughter joined the Rossier School of Education in January, 2010 as Professor of Education, with a joint appointment at the Viterbi School of Engineering. Slaughter has had remarkably distinguished career, which began as an electrical engineer and includes leading two universities and heading the National Science Foundation (NSF) as its first African American director, among many other accomplishments. His education research has been in the areas of higher education leadership, diversity and inclusion in higher education, underrepresented minorities in STEM, and access and affordability. In his new position at Rossier and Viterbi, Slaughter will be looking at the intersection between engineering and education, with a focus on what has become his lifelong quest of increasing minority participation in the science and engineering fields. In 1956, Slaughter began his career as an engineer at General Dynamics Convair, which he left in 1960 to work as a civilian at the United States Naval Electronics Laboratory Center in San Diego. He worked for the Navy for 15 years, becoming director of the Information Systems Technology Department. Slaughter went on to become director of the Applied Physics Laboratory, a research and development facility at the University of Washington in Seattle, until his appointment as assistant director of the Astronomical, Atmospheric, Earth and Ocean Sciences directorate of the NSF in Washington, D.C. in 1977. In 1979, Slaughter became academic vice president and provost of Washington State University, but left for his historic appointment in 1980 as the first African American to direct the National Science Foundation (NSF). He returned to higher education in 1982 as chancellor of the University of Maryland, where he made major advancements in the recruitment and retention of African American students and faculty. Slaughter took the job of president of Occidental College in 1988, and transformed the school during his 11-year tenure into the most diverse liberal arts college in America. 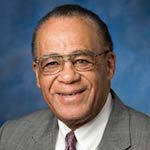 He taught courses in diversity and leadership for one year as Irving R. Melbo Professor of Leadership Education at USC before accepting the position of president and CEO of the National Action Council for Minorities in Engineering (NACME), whose mission is to increase the number of engineers of color, in 2000. He is a Member of the National Academy of Engineering (NAE) and the Hall of Fame of the American Society for Engineering Education. He is a Fellow of the American Academy of Arts and Sciences, the American Association for the Advancement of Science, the Institute of Electrical and Electronic Engineers, and the Tau Beta Pi Honorary Engineering Society. He is the founding editor of the international journal, Computers & Electrical Engineering. Slaughter holds honorary degrees from more than 25 institutions, and has received numerous awards, including the Martin Luther King, Jr. National Award in 1997; UCLA Medal of Excellence in 1989; the first U.S. Black Engineer of the Year award in 1987; the NAE Arthur M. Bueche Award in 2004; UCLA Distinguished Alumnus of the Year in 1978; NSF Distinguished Service Award in 1979, among many others. Slaughter holds a Ph.D. in engineering science from the University of California, San Diego (1971), a M.S. in engineering from the University of California, Los Angeles (1961), and a B.S. in Computer Sciences from Kansas State University (1956).